Business Bankers work for commercial banks and help the firms in providing financial services and products and guide them in expanding or maintaining their business. 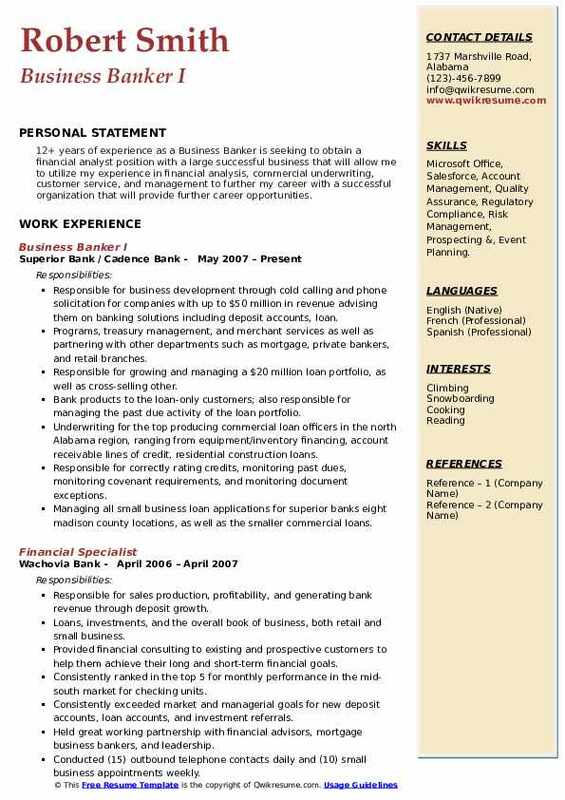 Business Banker Resume demonstrates tasks and duties such as – managing the loan portfolio of the firm, performing a careful analysis of prospective client’s needs, determining optimal banking solutions, monitoring and managing banking relationship, proposing effective solution that will deliver positive financial results, engaging and welcoming new clients into the bank family, ensuring delivery of best service and largest ROI’s. 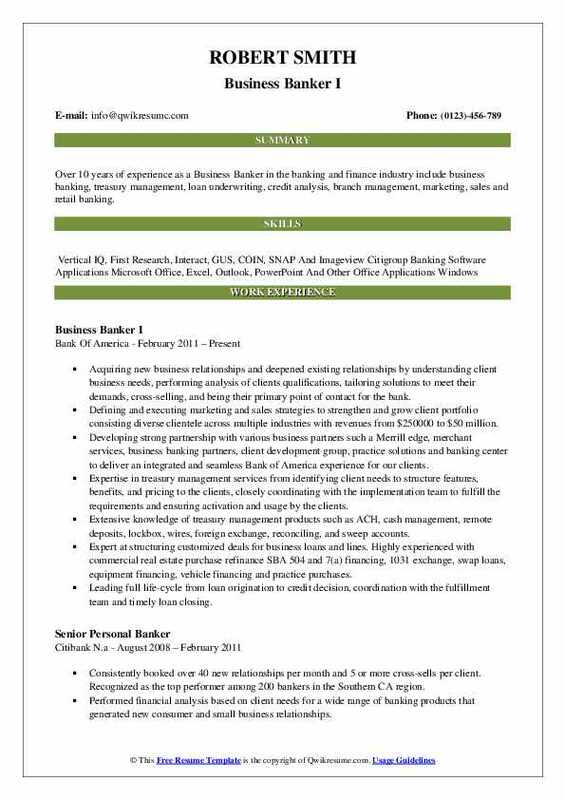 To provide such an exemplary service as a Business Banker, these skills and competencies will prove to be resourceful – show a great inclination towards sales and customer service, ability to maintain a high level of professionalism, ability to handle all flows of information, proficiency with industry standards and policy amendments, and sound judging skills. Getting into this profession is possible with a Master’s degree in Finance or Business management related courses. Objective : 3+ years of experience as a Business Banker is seeking to obtain a challenging position as a Bank Manager, that will utilize my skills and experience, with an opportunity for growth and advancement as a team player. Skills : GAAP, Business To Business Sales, Leadership, Business Lending, Business Development, And Financial Statement Analysis. Handling 80-100 calls per day while maintaining an outstanding level of customer satisfaction. Ability to navigate multiple computer screens while working on the phone. Using a variety of sources for information, including multiple computer systems and tools. Servicing inbound customer and partner calls, providing general account maintenance. Providing immediate response to all complex issues of business customers and correlating departments. Identifying and offering packaged product solutions, proactively suggest product solutions and services, and initiate partner referrals that meet customers'needs and financial goals. Completing general account maintenance request in the scope of account conversions, ineligible linkage, incomplete packages, holds, restraints, etc. Reviewing, verifying and, or identifying customer transactions to detect/prevent financial crimes activities and suspicious situations in order to mitigate and/or recover losses. Exhibiting a high level of customer engagement in order to ensure calls were rarely escalated to team leads or supervisors. Knowledge and understanding of consumer products, policies, and procedures; within a call center environment. Researching and analyzing customer/account profiles and transactions to determine loss potential and take appropriate actions. Knowledge and understanding of retail compliance controls, risk management, and loss prevention. Summary : 7 years of proven experience as a Business Banker in senior business and consumer banking operations, sales, client, and customer excellence, including OMEGA certification. Outstanding sales and relationship management results with area business banking clients. 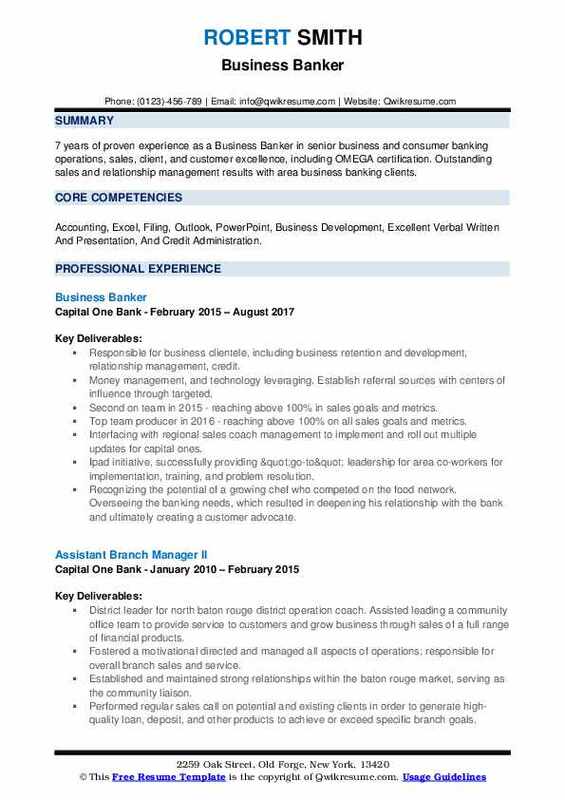 Skills : Accounting, Excel, Filing, Outlook, PowerPoint, Business Development, Excellent Verbal Written And Presentation, And Credit Administration. Responsible for business clientele, including business retention and development, relationship management, credit. Money management, and technology leveraging. Establish referral sources with centers of influence through targeted. Second on team in 2015 - reaching above 100% in sales goals and metrics. Top team producer in 2016 - reaching above 100% on all sales goals and metrics. Interfacing with regional sales coach management to implement and roll out multiple updates for capital ones. Ipad initiative, successfully providing "go-to" leadership for area co-workers for implementation, training, and problem resolution. Recognizing the potential of a growing chef who competed on the food network. Overseeing the banking needs, which resulted in deepening his relationship with the bank and ultimately creating a customer advocate. Building strong rapport with potential and existing clients; maintain a regular calling program to generate high. Quality new deposit and loan business from existing clients; meet and exceed specific production goals. Full PL oversight, staffing, strategic planning, daily management, and relationship management of the business. Clients in $1,000,000-$10,000,000 annual revenue range for banking products and private banking deposits. Expand prospect and COI base through consistent community networking resulting in over 9m in the new deposit. 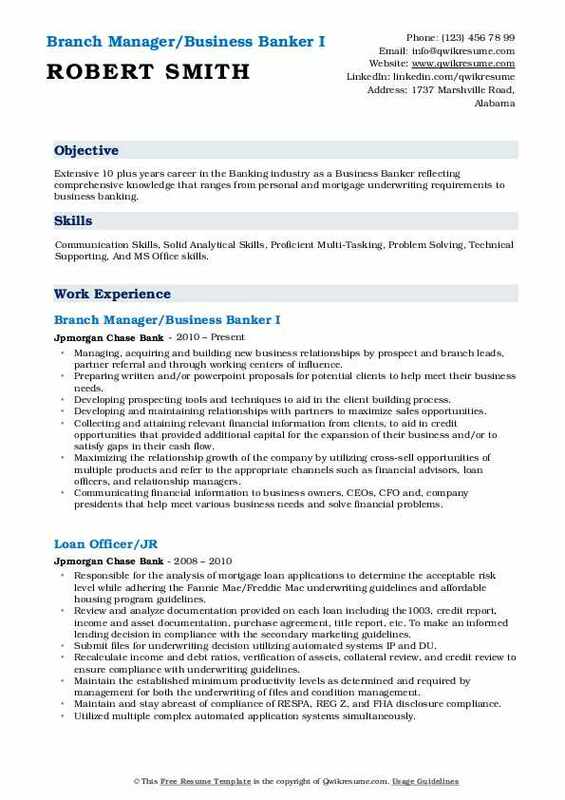 Summary : Over 10 years of experience as a Business Banker in the banking and finance industry include business banking, treasury management, loan underwriting, credit analysis, branch management, marketing, sales and retail banking. Acquiring new business relationships and deepened existing relationships by understanding client business needs, performing analysis of clients qualifications, tailoring solutions to meet their demands, cross-selling, and being their primary point of contact for the bank. Defining and executing marketing and sales strategies to strengthen and grow client portfolio consisting diverse clientele across multiple industries with revenues from $250000 to $50 million. Developing strong partnership with various business partners such a Merrill edge, merchant services, business banking partners, client development group, practice solutions and banking center to deliver an integrated and seamless Bank of America experience for our clients. Expertise in treasury management services from identifying client needs to structure features, benefits, and pricing to the clients, closely coordinating with the implementation team to fulfill the requirements and ensuring activation and usage by the clients. Extensive knowledge of treasury management products such as ACH, cash management, remote deposits, lockbox, wires, foreign exchange, reconciling, and sweep accounts. Expert at structuring customized deals for business loans and lines. Highly experienced with commercial real estate purchase refinance SBA 504 and 7(a) financing, 1031 exchange, swap loans, equipment financing, vehicle financing and practice purchases. Leading full life-cycle from loan origination to credit decision, coordination with the fulfillment team and timely loan closing. Coaching business bankers, merchant partners, merrill edge advisors and banking center associates on business banking products, tools and sales strategies to drive collective team performance. Mentoring a business banker in marketing and sales strategies, products and policies. Providing constructive actionable feedback on regular basis to motivate and drive results. Recognizing amongst management and peers as a go to person for sales and marketing tools. Leveraging a center of influences such as CPAs, real estate brokers, and attorneys to develop strong community contacts. Headline : 5 years of experience as a Business Banker is looking to obtain a challenging position that will allow me to learn and advance beyond my current abilities while building a strong business relationship with the company and clients QUALITIES Bilingual, charismatic, outgoing, driven, responsible, loyal, organized. Skills : Excellent Analytical, Organizational And Problem Solving, Strong Interpersonal, Verbal And Written Communication, Sap, And Microsoft Office. Executed integrated sales, relationships and credit strategies desired by business. Managed a portfolio of over 300 business customers between 4 branches and $150million in total deposits. Served as a trusted advisor and uses expert knowledge to recommend and promote. Cash management solutions to clients/prospects to best serve their cash flow needs while still. Booked and exceeded $1mm branch credit goals through business lines, loans. Acquired cross-sold new business relationships by referrals from COIS. Selected to participate in the business banking leadership development program. Motivate my team through individual team feedback sessions that will ensure the successful development and performance of all team members in the areas of deposit growth. Branch productivity, customer retention, customer cross-sell and growing our customer base. Managed and coached all sales process through our 5 step star process. Achieved satisfactory branch audits by implementing all bank policies procedures to ensure branch integrity. 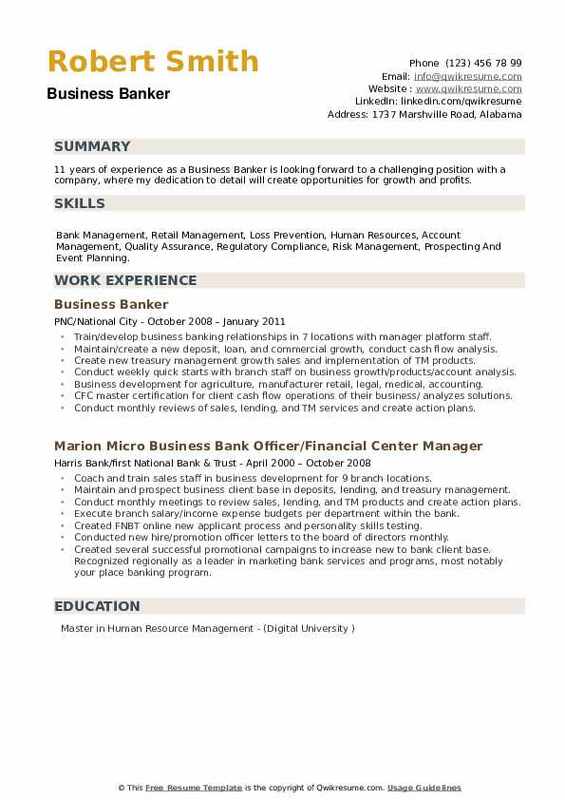 Summary : 16+ years of experience as a Business Banker. Highly motivated and skilled sales and relationship management professional seeking to obtain a position in an organization that welcomes initiative, dedication, and experience; a Self-motivated and driven individual with broad-based functional experience, refined academics, and demonstrated ability to improve profits by increasing sales, effectively negotiating and extending market penetration. Skills : Fluent In Spanish Technology: Microsoft Word, Excel, And PowerPoint, Lotus Notes 4.67 Certifications, NYS Life, Accident And Health Insurance Exam, And NYS Notary Public Certification. Developing new-to-bank business relationships as well as cross-marketing of services to existing business clients with annual revenues up to $5 million. Responsible for client satisfaction and relationship profitability, while providing business customers with a single point of contact within City. Providing product specialists with qualified referrals for cross-selling. Assisting in closing deals across all products. Ensuring customers meet credit/compliance criteria before submitting to centralized credit for approval up to $1,000,000. Partner with the Citi businesses (i.e., Retail banking, treasury, etc. ) to ensure ongoing and appropriate communication to support overall client and franchise objectives. Maintaining frequent interaction with centers of influence, diverse industry segments, community leaders, regulators, and senior business contacts. Strictly adhere to internal control policies such as the account opening protocols of accurate collection, completion, and updating of all required documentation. Ensuring that the organizations' activities are carried out in accordance with all regulatory, legal, and governmental regulations. 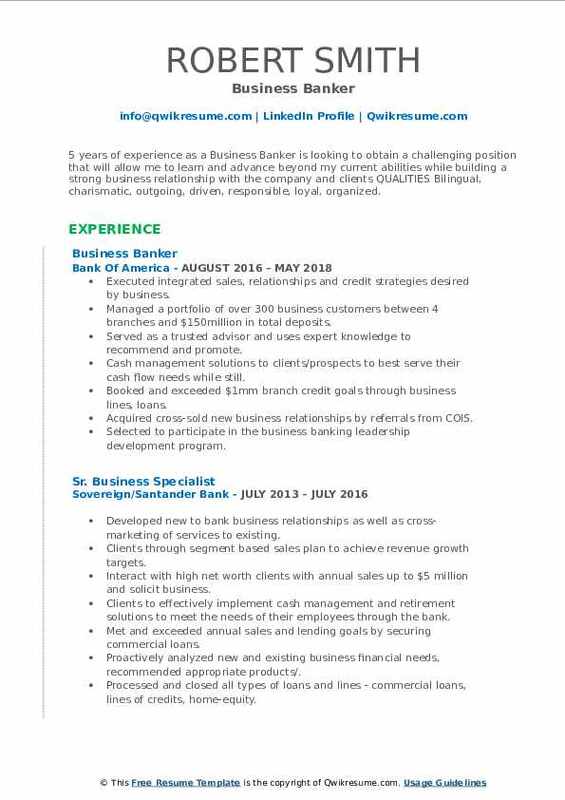 Summary : Extensive 10 plus years career in the Banking industry as a Business Banker reflecting comprehensive knowledge that ranges from personal and mortgage underwriting requirements to business banking. Skills : Communication Skills, Solid Analytical Skills, Proficient Multi-Tasking, Problem Solving, Technical Supporting, And MS Office skills. Managing, acquiring and building new business relationships by prospect and branch leads, partner referral and through working centers of influence. Preparing written and/or powerpoint proposals for potential clients to help meet their business needs. Developing prospecting tools and techniques to aid in the client building process. Developing and maintaining relationships with partners to maximize sales opportunities. Collecting and attaining relevant financial information from clients, to aid in credit opportunities that provided additional capital for the expansion of their business and/or to satisfy gaps in their cash flow. Maximizing the relationship growth of the company by utilizing cross-sell opportunities of multiple products and refer to the appropriate channels such as financial advisors, loan officers, and relationship managers. Communicating financial information to business owners, CEOs, CFO and, company presidents that help meet various business needs and solve financial problems. Contributing to multiple branch team efforts by referring clients to different areas of the financial institution, meeting with various departments managers and other in-branch personal to aid in team goal accomplishments. 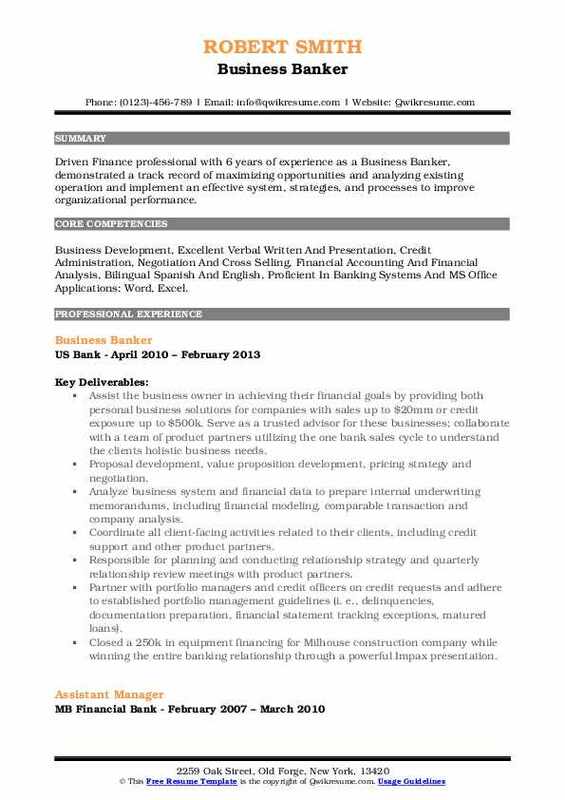 Summary : 16+ years of experience as a Business Banker. Results driven, self-motivated professional with precise attention to detail, data, objectives, and deadlines. A strategic and tactical leader with a focused approach to relationship management. Able to set effective priorities and execute decisions. Skills : Excellent Analytical, Fluent In Armenian And Russian, Branch Specialist, Self Motivated, Assertive, Deepening, Retaining Relationships, Driving Branch, P&L Growth, Ethical Professional Services, And Microsoft Word. Developing and implementing strategic plans to grow and maintain consumer and business banking relationships within the affluent market. Reviewing financial documentation and facts to analyze, evaluate and assist business clients with appropriate credit structure. Providing clients with strategies to structure their personal and business debt based on comprehensive needs assessment. Soliciting new deposit and loan opportunities from existing clients, and prospects. Introducing clients to internal business partners to deepen relationships and deliver specialized solutions. Working with clients on repositioning deposit balances, investments, and retirement accounts as part of a comprehensive financial strategy. Designing and executing marketing activities for prospects for portfolio growth and networking opportunities within the financial services industry. Mitigate risk and loss by adhering to bank policy and regulatory compliance. Headline : Driven Finance professional with 6 years of experience as a Business Banker, demonstrated a track record of maximizing opportunities and analyzing existing operation and implement an effective system, strategies, and processes to improve organizational performance. 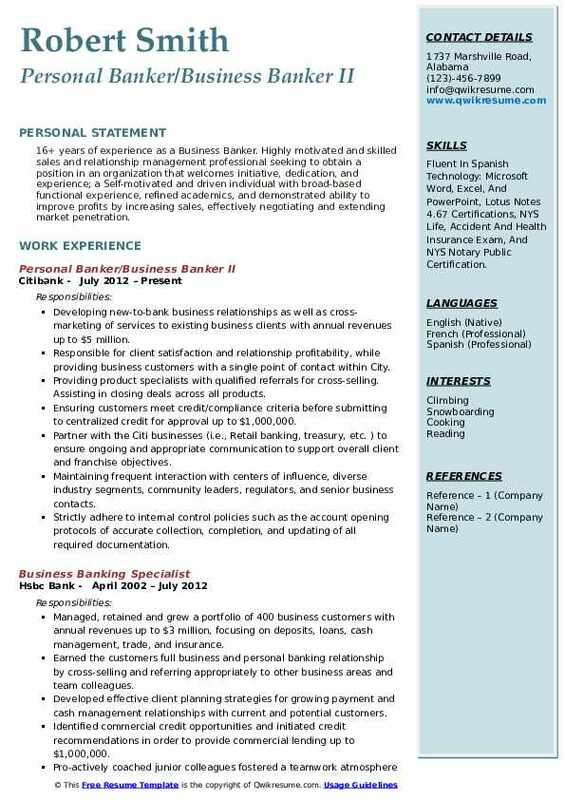 Skills : Business Development, Excellent Verbal Written And Presentation, Credit Administration, Negotiation And Cross Selling, Financial Accounting And Financial Analysis, Bilingual Spanish And English, Proficient In Banking Systems And MS Office Applications: Word, Excel. Assist the business owner in achieving their financial goals by providing both personal business solutions for companies with sales up to $20mm or credit exposure up to $500k. Serve as a trusted advisor for these businesses; collaborate with a team of product partners utilizing the one bank sales cycle to understand the clients holistic business needs. Proposal development, value proposition development, pricing strategy and negotiation. Analyze business system and financial data to prepare internal underwriting memorandums, including financial modeling, comparable transaction and company analysis. Coordinate all client-facing activities related to their clients, including credit support and other product partners. Responsible for planning and conducting relationship strategy and quarterly relationship review meetings with product partners. Partner with portfolio managers and credit officers on credit requests and adhere to established portfolio management guidelines (i. e., delinquencies, documentation preparation, financial statement tracking exceptions, matured loans). Closed a 250k in equipment financing for Milhouse construction company while winning the entire banking relationship through a powerful Impax presentation. Recognized for highest revenue banker in south Chicago region in fourth quarter 2011 ( 3. 5 million in closed sales). 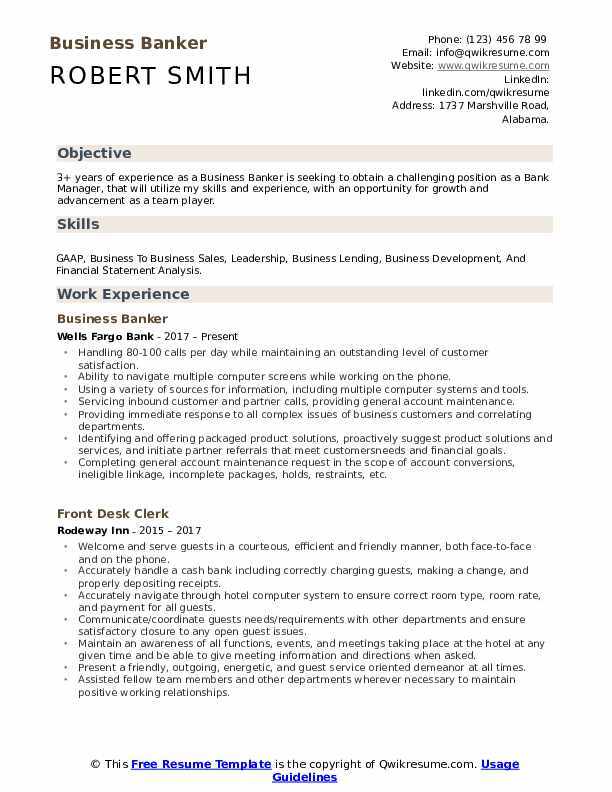 Summary : 12+ years of experience as a Business Banker is seeking to obtain a financial analyst position with a large successful business that will allow me to utilize my experience in financial analysis, commercial underwriting, customer service, and management to further my career with a successful organization that will provide further career opportunities. Skills : Microsoft Office, Salesforce, Account Management, Quality Assurance, Regulatory Compliance, Risk Management, Prospecting &, Event Planning. Responsible for business development through cold calling and phone solicitation for companies with up to $50 million in revenue advising them on banking solutions including deposit accounts, loan. Programs, treasury management, and merchant services as well as partnering with other departments such as mortgage, private bankers, and retail branches. Responsible for growing and managing a $20 million loan portfolio, as well as cross-selling other. Bank products to the loan-only customers; also responsible for managing the past due activity of the loan portfolio. Underwriting for the top producing commercial loan officers in the north Alabama region, ranging from equipment/inventory financing, account receivable lines of credit, residential construction loans. Responsible for correctly rating credits, monitoring past dues, monitoring covenant requirements, and monitoring document exceptions. Managing all small business loan applications for superior banks eight madison county locations, as well as the smaller commercial loans. 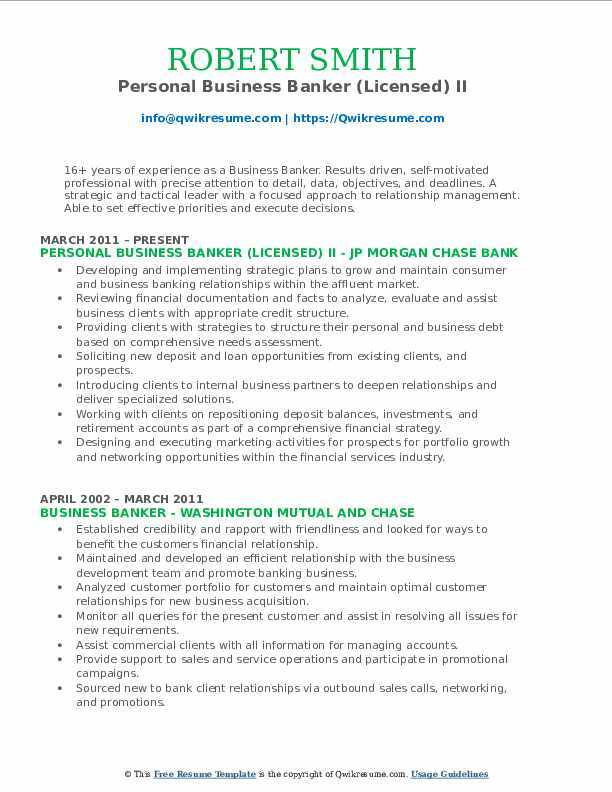 Summary : 11 years of experience as a Business Banker is looking forward to a challenging position with a company, where my dedication to detail will create opportunities for growth and profits. Skills : Bank Management, Retail Management, Loss Prevention, Human Resources, Account Management, Quality Assurance, Regulatory Compliance, Risk Management, Prospecting And Event Planning. Train/develop business banking relationships in 7 locations with manager platform staff. Maintain/create a new deposit, loan, and commercial growth, conduct cash flow analysis. Create new treasury management growth sales and implementation of TM products. Conduct weekly quick starts with branch staff on business growth/products/account analysis. Business development for agriculture, manufacturer retail, legal, medical, accounting. CFC master certification for client cash flow operations of their business/ analyzes solutions. Conduct monthly reviews of sales, lending, and TM services and create action plans.